The Rod Laver Arena Guided Tours provide a unique behind the scenes experience of Melbourne’s most dynamic sports and entertainment venue. 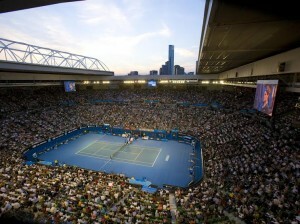 Rod Laver Arena Guided Tours are run daily by experienced and knowledgeable Tennis World tour guides. The tours provide a unique behind the scenes experience of Melbourne’s most dynamic sports and entertainment venue. Visitors will be taken through the back stage areas used during the Australian Open Tournament including; Tournament Control, the Player Change Rooms used by the world’s top seeded players, inside Rod Laver Arena and a Corporate Superbox, the Walk of Champions, Davis Cup Room and inside the purpose built Media Theatrette that hosts the post match press conferences during the Australian Open. Bookings are not required for small groups of under 10 people. Group Bookings of more than 10 people are welcome, times negotiable. Please note: When events or concerts are scheduled in Rod Laver Arena, access inside the Rod Laver Arena may be restricted. Feel free to Contact Tennis World a few days prior to your visit to check the level of access on your chosen day.